Music matters and it’s something we can’t live without. It enriches our lives , inspires us, and lift our spirits. Enjoy rich and complex rhythms without even missing a single beat. Vivo V7+ Portrait Mode helps you to capture crystal clear selfies which focuses more on your face. Get ready to create stylish selfies using a large aperture focus, just like a DSLR camera. Vivo V7+ qualcomm octa-core CPU and 4GB RAM ensures smooth and powerful performance. The 64GB ROM means you have ample storage for all your favorite photos, music, videos and important professional files. Face Beauty 7.0 mode offers crystal clear photos with natural face enhancement. You’ll look natural and beautiful, even in dimly lit environments. The high quality 16MP Rear Camera with PDAF technology and optmised algorithms helps you shoot clearer, brighter & more detailed photos. The rear camera’s 64MP ultra HD functionality merges four frames into one creating astonishingly detailed images. The live photo feature brings your photos to life by creating a moving image. It’s comfortable to hold and fits perfectly in palm of your hand. 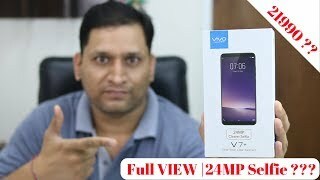 Vivo V7+’s revolutionary 5.99 inch Full View Display offers amazing visual experience. Screen-to-body ratio of 84.4% and its 2.15mm narrow bezels makes it stand out from the rest of smartphones.